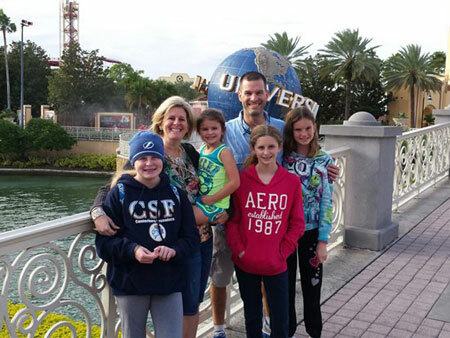 Dr. Lee Friedman, a radiologist from St. Petersburg, Fla., spends time with his family. (BPT) – The human heart is incredible: It pumps 2 ounces of blood in every heartbeat, totaling at least 2,500 gallons daily. It has its own electrical pulse and beats 100,000 times a day. Yet, unless there’s something wrong with yours, you probably don’t give your heart a second thought from day-to-day. Perhaps no one understands this better than Dr. Lee Friedman, a radiologist from St. Petersburg, Florida. When he was told he needed a pacemaker, Friedman realized his heart condition might require him to quit his job, because historically pacemakers weren’t approved for use with an MRI – a common tool used by radiologists. Friedman’s job meant he was surrounded by MRI machines every day. He was also concerned he would not be able to get an MRI himself if he needed one in the future. Fortunately, after asking his doctor many questions, Friedman learned that a Medtronic pacemaker with SureScan Technology had received FDA approval for use in an MRI environment. He got the facts, made the treatment decision that was right for him, and was able to keep his job. Today he works closely with his physician to ensure his heart stays healthy. 1. Heart disease is the No. 1 cause of death in the U.S.
Heart disease is the leading cause of death in the U.S., causing one in four deaths, according to the Centers for Disease Control and Prevention (CDC). This is higher than cancer, diabetes, stroke and accidents. It’s important to ask your doctor about risk factors and what you can do to keep your heart healthy, including exercising and maintaining a proper weight. 2. Exercising is one of the best ways to boost heart health. If you want to cut your risks of heart disease it’s best to start a regular exercise routine. The Mayo Clinic recommends exercising for 30 minutes on most days of the week. This helps to reduce your chances of developing conditions that strain the heart, like high blood pressure, high cholesterol and diabetes. If you can’t exercise 30 minutes at one time, break it up into three, 10-minute-sessions throughout the day. 3. One in three American adults has high blood pressure. A woman’s heart beats about 78 times per minute, while the male heart beats about 70 beats per minute. This creates blood pressure, the force of blood against artery walls, which can change throughout the day depending on what you’re doing or how you are feeling. If it’s high for too long, it can pose serious health risks. One in three American adults, or 67 million people, have high blood pressure, according to the CDC. A physician can easily diagnose high blood pressure and determine a treatment plan, so it’s important to talk about testing at your next annual exam. 4. More Americans are needing pacemakers; access to an MRI is important. You may not think you’ll ever need a pacemaker, but statistics show that the number of people getting them is on the rise. The likelihood of needing a pacemaker increases with age; however, numerous conditions might require you to get a pacemaker earlier in life. If you are diagnosed with a slow heart beat – also known as bradycardia – you may need a pacemaker. Between 50 and 75 percent of people with pacemakers may need to undergo MRI scans at some point in their lives, so pacemakers that are MRI-compatible may be a wise choice. For additional information about MRI and pacemakers, please visit www.mypacemaker.com. 5. Treating a heart attack within an hour improves survival odds. Heart attack survival rates increase by 23 percent if you get treatment within three hours and by 50 percent if you get treatment within an hour, according to the American Heart Association. One of the biggest issues about a heart attack, which can happen to a person at any age, is that the symptoms aren’t always obvious. Learning the symptoms and taking immediate action is key: symptoms include shortness of breath, extreme fatigue, dizziness, nausea, stomach pain and chest discomfort. Ask your doctor about more often-ignored symptoms. Dr. Lee Friedman, a radiologist from St. Petersburg, Fla., spends time with his family and serves patients as a radiologist, thanks to his pacemaker that is FDA-approved for use in an MRI environment. Learn more at www.mypacemaker.com.